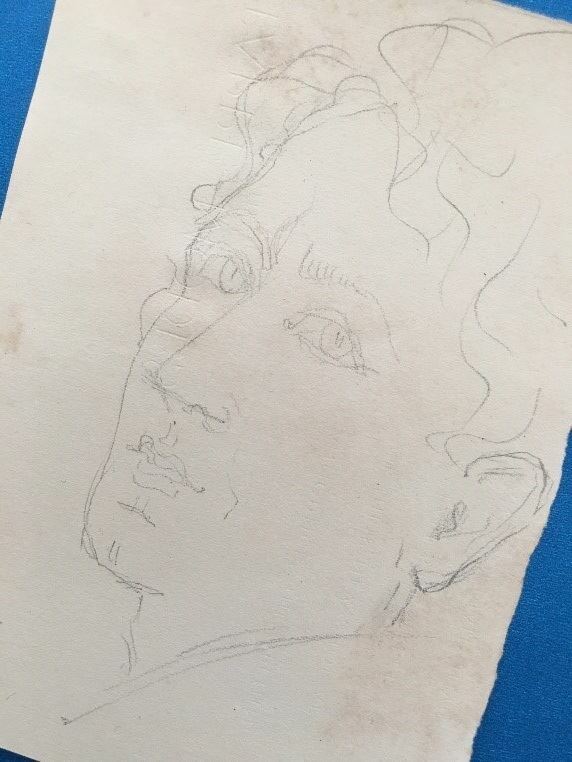 "To learn piano, study the Cyril Scott Sonata No.1," said Percy Grainger to the young piano student, who, after dutifully acquiring the sheet music, was completely mystified by Grainger's odd advice. This incident and many more were shared by Grainger enthusiast Dana Perna on a recent Sunday afternoon at 7 Cromwell Place. Grainger was acquainted with practically anyone who was anyone in the music world during his early 20th century career. His colleagues included Vaughan Williams, Edward Elgar, Richard Strauss, Claude Debussy, and Frederick Delius. Dana mentions them all, along with many others, during this engaging lecture. In the early 20th century, Percy Grainger wrote a virtuoso concert work entitled In Dahomey (Cakewalk Smasher), in which he blended tunes from Will Marion Cook's Broadway show and Arthur Pryor's popular song. Grainger may have seen Cook's In Dahomey on stage in London in 1903 and he started composing his work that year, completing the score about 1909. In this tribute to contemporary African-American music, the clash of the two tunes created what Grainger Society President Barry Ould has termed "a page of almost Iversian dissonance." After consulting with Barry, Petty Officer David Miller arranged In Dahomey and shared the final production with the Grainger world. Here is a conversation about how it happened. Long-time Grainger aficionado Mark Grant explains some of the piano techniques that Percy Grainger found particularly useful to develop his own style and maximize the use of the instrument. For example, Grainger used large, extravagant chords, which he termed "harping chords" repeatedly and became a master of the sostenuto pedal (the middle piano petal) to translate the sounds of an orchestra into the piano. Mark compares Grainger's playing to other pianists of his day and beyond. His talk allows Grainger's techniques to come alive for the audience with examples, illustrations and explanations along the way. The British Library has made available about 350 English folk songs recorded by Percy Grainger in different regions of England between 1906 and 1909. The sound recordings have been cataloged and indexed by librarian, researcher and folklorist Steve Roud, author of Folk Song in England (Faber & Faber, 2017). Roud has also matched them up with Grainger's transcriptions of the songs, where these exist, on the Vaughan Williams Memorial Library website, thanks to their digitization of the Percy Grainger Manuscript Collection. Links have also been included on the Vaughan Williams Memorial Library website to corresponding sound recordings featured on British Library Sounds. Listeners are able to hear the songs while following Grainger’s unique transcriptions of recordings by singers. Examples include folksingers: Joseph Taylor, Joseph Leaning, George Gouldthorpe, Charles Rosher, William Fishlock, Tom Roberts, Dean Robinson, and many more. All recordings have been cataloged to include Roud numbers (this number refers to songs listed in the online databases Folk Song Index and Broadside Index), Grainger’s Melody numbers, and the numerical references to the discs and wax cylinders these sound recordings existed on previously. While he grew to hate performing Country Gardens, it is most certainly the song most identified with Grainger. His 1919 performance is recorded on a piano roll for all to enjoy. Mark N. Grant and Susan Edwards Colson, IPGS Board Members, discuss the Percy Grainger Home, 7 Cromwell Place, with Marie Silverman Marich, from White Plains Beautification Foundation. Marie's broadcast, This Blooming City, uses Percy Grainger's composition, Country Gardens, as its theme song. Percy talks about collecting folk songs, plays, and talks about meeting Edvard Grieg. Interesting. Percy Pondered "All Sorts of Questions"
By the late 1970's visitors to 7 Cromwell Place were a routine event. Someone finally decided in October 1977 that it would be a good idea to keep a record. The Guest Book was acquired and took its place on a desk in the corner of the dining room. The Guest Book's pages hold quite a story. The very first signature is Burnett Cross. He's the fella who worked on the free music machines with Percy during the 1940's into the 50's. It is fitting that he has the honor of starting off. About midway down the second page is Barry Ould's signature. His visit is dated May 1, 1978, Ella Grainger's birthday. Barry, the current president of the International Percy Grainger Society, was lucky to arrive just then and spend some time with Ella. Ella passed away a little over a year later in July 1979 at 90. Barry keeps visiting White Plains each year and tending the collection. Percy Grainger's works are still a major focus of Barry's music publishing company, Bardic Editions. Two lines down from Barry, British Composer Ronald Stevenson signed in beautifully crafted script. He must have come to celebrate Ella's birthday, since his signature is dated May 1st also. It's interesting to see who has visited 7 Cromwell Place over the years. Many musicians, often along with their families and friends, and a band director or two. Several years ago, the IPGS board was holding its annual meeting when there was a knock at the door. It was the band director from Ohio State University, who happened to be passing by. He decided to knock and had the good fortune of catching the board mid-meeting. Rolf Stang, Ella's longtime friend, dutifully left the meeting and led a tour. Historic Landmark Dedication sign and examine the Guest Book. Last year, the entire band, two buses full of high students, from Fargo North High School, Fargo, North Dakota, stopped by. With over eighty students, the house was overflowing, but each seems to have a great time looking over Percy's scores and programs. 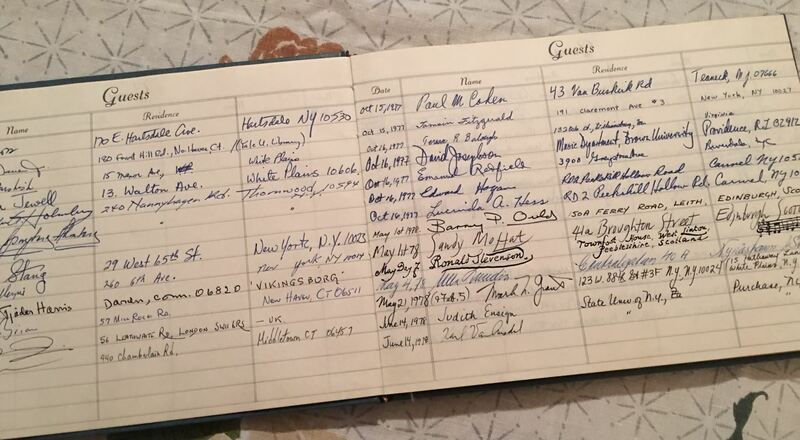 Each one, along with their chaperones, signed the Guest Book. The Guest Book is nearly filled now, ready to be filed away. It will take its place in among the many treasures that make up 7 Cromwell Place. To visit to 7 Cromwell Place is to step back in time—and to step into Percy and Ella Grainger’s life. There is Percy’s bamboo chin-up bar irreverently fixed across the columns in the parlor. There are Percy’s pianos--all three squeezed into a small music room. Glancing around in the front hall lets you know right away that, while this large grand house was built by a banker to make a statement about his social position and place in society, the Graingers used it a little differently. To the Graingers it was home. Percy and his mother, Rose, moved here in May 1921. Percy took the summer off from his near-constant touring schedule to settle in and help Rose unpack the shipment from London. (They had left on a moment’s notice as WWI broke out, and their furniture had been hastily packed away in 1914.) But at the end of April 1922, the ailing Rose took her own life and Percy was at loose ends over the death. Percy saved pages from the New York Times, carefully chosen for the fact that they contained tragic stories, wrapped the brass bed from Rose’s room, and placed it in the attic. The porch swing where they sat to enjoy summer 1921 was taken down and placed in the attic, too. There they remain. In 1928, after her marriage to Percy (in the Hollywood Bowl! ), Ella Viola Strom moved in to 7 Cromwell Place. She must have sensed that she was stepping into Rose’s home. 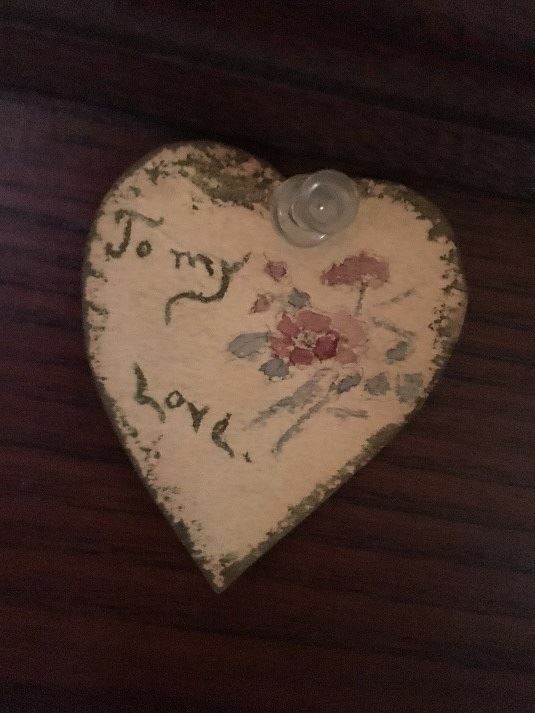 Rose’s dishes were still in the pantry, her mementos and family pictures still in her room. Percy and Ella dressed in their wedding finery and had photos taken by the front stairs. A new era was starting at 7 Cromwell. Morse was the leading portrait photographer in White Plains and his wife Tonie was the niece of Percy's concert agent Antonia Sawyer. Fred and Tonie were Percy’s friends and had long stayed in the house while Percy was away (and he was always away-- his list of concert dates is astounding.) The Morses knew that Ella had met Percy on a trip returning from Australia, and that she had been in Australia visiting her lover, Iyemasa Tokugawa. To remind her that they knew her background, and possibly suspicious of her present motives, the Morses had the dining room papered in an Asian-themed wall paper. Ella got the message. The dining room was recovered in a more suitable style. The Morses were moved next door to a house (no longer standing) that Percy built for them at 9 Cromwell. Ella lived at 7 Cromwell for the rest of her life. Recipes in her handwriting are still in the kitchen. Her stuffed-to-overflowing sewing stand sits in the dining room. One of her most poignant touches are the tiny artworks and jottings she left around remembering Percy: a tiny heart tacked on his bedroom door, a note placed on a promotional poster for some concert or that other where a little yellow sticky notes that “this captures the serious look at PG often had,” and sometimes the beginning of a sketch on the back of a receipt from a New York shop “Tappe Mode.” Also prominently displayed in the living room are several of Ella's "rime tiles" -- exquisite ceramics Ella crafted with her own poems and illustrations etched in. 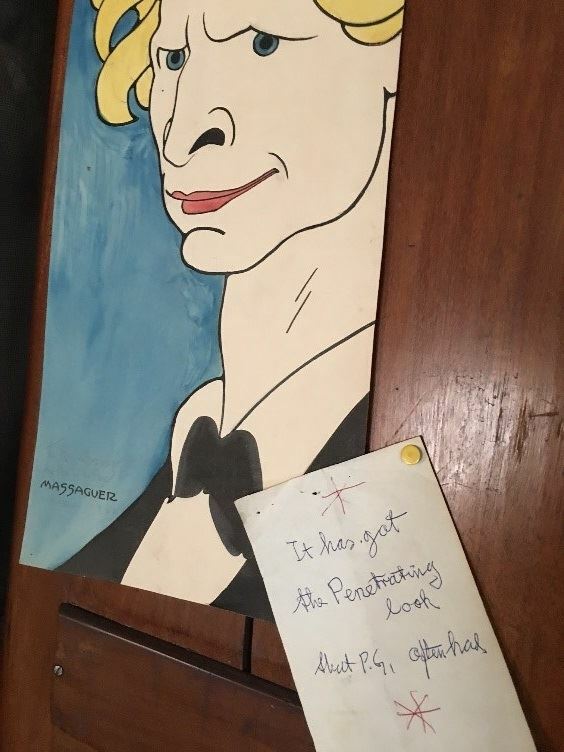 The Grainger story is written room-to-room at 7 Cromwell Place. If you forget, just look around.